Ottawa Valley Gift Baskets is located in the heart of the Ottawa Valley where we are blessed to have a myriad of producers creating many tasty treats and local delicacies. We are pleased to promote some of these local specialty food products for your tasting pleasure and have provided a brief listing of the main products/suppliers that we carry in our gift baskets below. Ottawa Valley Gift Baskets is certain that you will find these product selections superior in quality and taste - in fact, we guarantee it! Please click on the active website links/images below and be sure to check out our Fine Food Products section for more detailed product and supplier information. Balderson Cheese is Canada’s best tasting and most recognized name in premium-aged cheddar cheese. The reputation of Balderson Cheese is built on a century-long tradition that began in 1881 when a small group of dairy farmers from Eastern Ontario pooled their resources and established the Balderson Corners Cheese Factory. Since then, Balderson Cheese has won numerous awards, including Grand Champion status at several major cheese competitions. Present-day production facilities are now located in Winchester, Ontario. Balderson Cheese is sold in leading Canadian supermarket deli departments, fine food stores, specialty cheese shops, health food stores, selected wineries across Canada and by Ottawa Valley Gift Baskets! Equator Coffee Roasters was formed out of owner/operator, Craig Hall's strong desire to expand the market and use of fairly traded coffees in Canada. Good coffee tastes better if it is freshly roasted. Equator Coffee Roasters coffee is superior in quality, freshness, and responsibility - environmentally and socially! Equator Coffee Roasters has chosen to separate itself from other specialty coffee roasters by using only certified fair trade and organic coffees - roasting all their blends locally in Almonte, Ontario. Ottawa Valley Gift Baskets is proud to promote Equator Coffee Roasters and carries local "brand- names" - Algonquin Dark (Bold), Eh!Spresso (Bold), Mufferaw Jo! (Bold), Freakin' Good Coffee (Smooth), Madawaska Morning/Breakfast Blend (Smooth), and Sweet Justice (Smooth) in select gift baskets. Product availability subject to seasonal supply/demand. Hall's Orchards is located east of Brockville on a small farm owned by Chris Hall and his wife Kim. Chris grew up on the farm, taking over the family business in 1997. 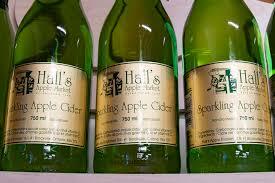 Hall’s Sparkling Apple Ciders are a non-alcoholic drink. They start by using their famous fresh pressed sweet apple cider, which is blended with pure natural fruit juices to create naturally sweet ciders. Their sparkling ciders are carbonated and contain no added sugars and are fat free, cholesterol free, and low in sodium; which makes them suitable for people on a sugar or sodium reduced diets. Our ciders are best served if chilled between 4-8 degrees Celsius. 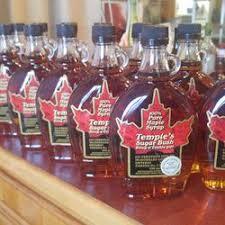 Each batch is pasteurized and maintains a two- year shelf life, but they are usually consumed long before then. 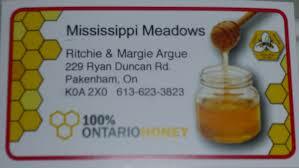 Ottawa Valley Gift Baskets is proud to offer MISSISSIPPI MEADOWS HONEY. Locally produced in Pakenham by Ritchie and Margie Argue. 100% Ontario honey. MISSISSIPPI MEADOWS HONEY is available online and in select gift baskets. Mrs. McGarrigle’s came to life in 1988, born of the spirit and determination of its founder, Janet Campbell. Though humble in its beginnings – manufacturing condiments in the basement of one of Ottawa’s hostels after-hours – Mrs. McGarrigle’s has morphed into a stylish gourmet food, fine kitchenware and home décor retailer – a unique epicurean destination in the National Capital area and an undeniable lure for those who enjoy fine cooking, fine dining and fine living. Mrs. McGarrigle's Fine Foods is situated in picturesque Merrickville. We are proud to offer Chutneys in many of our baskets. 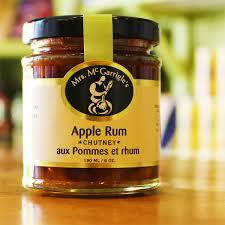 Both the peach/pear and the apple/rum are made all natural product with no additives or preservatives. These delicious chutneys are made in-store with fresh local ingredients. With an assortment of taste notes, these chutneys pair well with a variety of meats and cheeses. 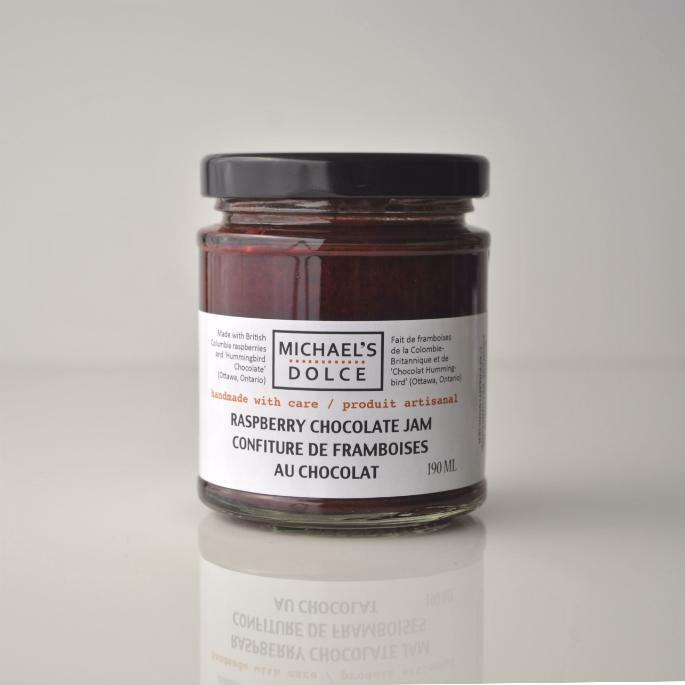 michalsdolce Gourmet Confectionery Jams - Michael Sunderland is the founder, proprietor, and confectioner at michaelsdolce, based in Ottawa, Ontario. A graduate in Culinary Arts from Algonquin College, Michael has worked in many kitchens – Fairmont Hotels & Resorts, fine restaurants, and catering businesses. In 2009, Michael began making gourmet jams and in January 2010, he established his own brand, michaelsdolce. michaelsdolce Gourmet Confectionery Jams are made with high quality ingredients to satisfy taste senses; savouring authentic flavours = not overbearing them in sugary sweetness. michaelsdolce gourmet jams are available for sale/savour in specialty food stores and fine restaurants in the Ottawa area. Ottawa Valley Gift Baskets is pleased to also carry michaelsdolce Gourmet Confectionery Jams in our on-line store as well as in some selected gift baskets – perfect on breakfast scones or as a dessert topping! The Nicastro Family in Ottawa - it all started in 1972 when the Nicastro Brothers opened their first store in Ottawa on Gladstone Avenue in Little Italy. This store first catered to the Italian immigrant families but soon grew in popularity and became Ottawa's favourite Italian grocer. Nicastro Brand products are carefully selected to offer up only the best quality and most authenic Italian food tastes. You are guaranteed best quality and value when you purchase a Nicastro Brand product. 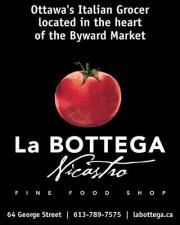 Nicastro Brand products are available at Nicastro's on Merivale Road and La Bottega in the Byward Market in Ottawa, Ontario. All Nicastro Brand sauces are made with the highest quality ingredients, from premium Italian tomatoes to real Parmigianno-Reggiano cheese. Ottawa Valley Gift Baskets is delighted to carry Nicastro Fine Foods products in our pasta and gourmet baskets and in our on-line store - BUON APPETITO! Perth Pepper and Pestle was founded in 1994 by Lynda Ridding as a stay-at-home mom's entry back into the workforce. Manufacturers of incredible red pepper jellies, garlic jellies, wine jellies, sweet mustards, gourmet chocolate and wine sauces, savoury sauces, specialty spices and flavourful sea salt blends (spice tubes) that are fabulous and easy to use everyday! Perth Pepper and Pestle provides a plethora of gourmet delights for Ottawa Valley Gift Baskets' fine food items and gift basket selections . We are constantly re-tooling our gift baskets to take full advantage of Perth Pepper and Pestle's imaginative creations and delightful food pairings. Perth Pepper and Pestle products are carried in many Eastern Ontario fine food retail locations...and also by Ottawa Valley Gift Baskets! Perth Pepper and Pestle is located in downtown Perth, Ontario. PUREST Natural Foods is a company that believes in giving consumers delicious, healthy choice products that are all natural whole foods - free of any artificial ingredients. PUREST Natural Foods specializes in gluten-free (GF), dairy free, wheat free, and corn free natural foods and is further dedicated to providing food mixes that address the top allergens affecting the population today. What distinguishes PUREST Natural Foods from their competitors is taste and purity - no malt dextrin, no dextrose, no added colours, no sulphates, and no fillers of any kind. PUREST Natural Foods' entire product line is NON GMO (genetically modified organisms) and are Kosher/Parve certified. PUREST Natural Foods products are sold all across Canada in select fine food shops and natural health food stores . Ottawa Valley Gift Baskets is delighted to carry PUREST Natural Foods' delicious Tea Biscuit and Scone mix, Muffin and Loaf mix, and Pancake and Crepe mix in many of our fine gift baskets and in our on-line store. PUREST Natural Foods is owned and operated by Robin Duncan and is located in Perth, Ontario. Natural Just Feels Good! Village Treats is an Ottawa Valley icon - a.k.a. the Creator of Delicious Chocolates. Village Treats products contain only the finest ingredients that bring out all the richness and flavour expected from a fine Chocolatier. Established as a fudge shop (1979) in an old Victorian-style house in Lanark Village - Village Treats quickly grew into a chocolate-making business. Using original recipes and classic confectionery machinery, all chocolates are made from scratch and cooked in large copper pots over open flame. Village Treats is owned and operated by Nick Levac and Galen Neilson and their company is famous for hand-crafted chocolates and truffles. Village Treats manufacturing/retail facility is located on George Street in the heart of Lanark Village - all products are available for sale at their store-front location and through several local Ottawa area gift shops and fine food stores. Ottawa Valley Gift Baskets is honoured to offer Village Treats chocolates, truffles, and candy products in our on-line store and in our gift baskets - why not let the "chocolate lover" in you out for a treat! Ottawa Valley Gift Baskets - a taste of the Ottawa Valley in every basket! Copyright © 2010 Ottawa Valley Gift Baskets. All Rights Reserved.